Today I’m answering questions from the second school to enter (and I sent them a free book for being among the first five entries), Thorp Academy. Class 7X1a English Class chose these from Stella and Jasmine and I’ve decided to answer ALL of them because I can do it quite quickly! Well done, Stella and Jasmine and thank you for your great questions! Yes, partly. I have strong memories of my teenage years and really finding lots of things difficult. I didn’t like myself and I didn’t know where I was going. I was also a perfectionist (still am), very ambitious (still am), high-achieving and I pushed myself far too hard (same). I made myself ill often through overworking and over-thinking and I didn’t take enough time to relax. I now realise you burn yourself out like that so you have to be kind to yourself and look after yourself. Also, I discovered that you work better if you take breaks! I had many years of stress-related ill-health and I don’t want other young people to have the same. I am the same personality I was – still stressy, anxious, perfectionist, ambitious etc – but I manage it well now and I never get stress-related illness any more. I’ve learnt the hard way and I want you to learn the easy way. Yes, the teenage stereotype is quite negative but it’s not the word that’s the problem, but how people think of teenagers. People are very unfair and unsympathetic because they don’t properly understand what you go through at this stage (even though all adults went through it, too and have just forgotten!) But it’s also not the best word because biologically being a teenager starts at about age 11, so “teen” isn’t accurate anyway. A better word is “adolescent”, because that means exactly what it says: “becoming adult”. But if people weren’t so negative about teenagers, there’d be no problem with the word! I wanted to answer both Jasmine’s questions because they’re connected. You are all “real” teenagers. 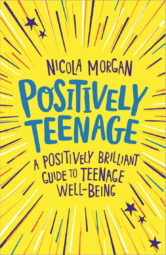 “Real” teenagers are not “trouble” – they/you are people going through physical, chemical and brain-based changes, as well as social changes, that can create stress, conflicts and upheaval. Some teenagers (and their adults) have an easier time than others, but even teenagers who don’t appear to be having difficulties are still “real” teenagers. I wish people wouldn’t think that being a real teenage meant being trouble! Those are genuinely typical of many teenagers. Adults quite often experience some of them, too, but most people will agree that these do “tend” to be associated with adolescence. And I think acknowledging that is important. If we don’t, young people who do experience those things deeply will wonder what’s wrong with them. There’s nothing wrong with them. that’s the point: it’s “normal” adolescence! Whether you find the changes you’re going through difficult or easy, you’re equally a real teenager. And it’s good to understand the changes – that’s what my work is about. Positively Teenage is the book I recommend to answer these questions more. I hope you’ll find it sympathetic, informative and totally respectful! Thank you, Stella and Jasmine! I enjoyed answering your questions. The decision about winners will be made when all the entries are in, after June 8th. Keep an eye out! 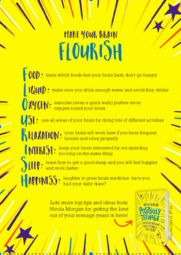 Meanwhile, be positively teenage and make your brain and body FLOURISH.